The name of your business not only describes its sphere of operations, but it also embodies the core philosophy of your enterprise. In today’s globalized context where technological innovations are constantly redefining marketing strategies, well-conceived business and domain names are essential for achieving a strong global reach. In essence, an appropriate, memorable and appealing name allows your business an edge over its competition. According to a study by Small Business Association, more than half of businesses shut shop after five years of starting their operations. Certainly, a bad business name should not become the reason for your failure. Easy as it may sound, naming your business is one of the most challenging tasks. As your business name represents you, make sure to avoid making these blunders. This tops the chart of our not-to-do list as there is nothing that can potentially harm your business more than the lack of a digital presence. Worse, it even allows other people to lay claims to the name that you had so thoughtfully crafted for your own business! When registering a domain is easy and inexpensive, why leave this stone unturned and leave a loophole? Register your domain today and book your spot in the digital landscape. Difficult names are often perceived by start-ups as trendy, awe-inspiring, or simply more eloquent. However, they are none of these and serve a real bummer for your business! Names which are difficult to spell or pronounce fail to register in the memory of your target audience. Similarly, avoid obscure metaphors and overly technical names at all costs. Also, it is extremely important that the name of your business is not gender biased, imbued with racial overtones, or is regarded offensive across certain cultures. Now, calling your outlet Hitler Pizza is really not done! In essence, a good business name is one that has positive associations, makes sense for the business, are fun to say, easy to spell and easy to remember. Who can dismiss or forget Spex in the City: An Opticians, or Pulp Friction: Paper Recycling Services. While naming your business, plan out an effective branding strategy simultaneously. This is needed as the success of any business name depends upon the image that gets created around it. The branding strategy should span over a period of six to twelve months to establish a stronghold among the target audience. While you need to stay away from showcasing your profound literary flair, your business name should not lack aesthetic appeal. An ideal name for your business must represent creativity albeit in a lucid manner. It should convey the essential brand values and focus on customer benefits. In essence, the business name should conform to both your sense and sensibility. Just because ABC nailed it, you can’t name your enterprise XYZ! Focus on creating your own. We agree that you ooze with creativity, but that might not be your best trait when it comes to choosing a business name. Remember, The Boring Company can work for Elon Musk because of his fan base, but is sure to act as a spoiler for your start-up! A business is all about evolution. If your business changes its focus or expands to include other products and services, an overtly specific brand name will become irrelevant. 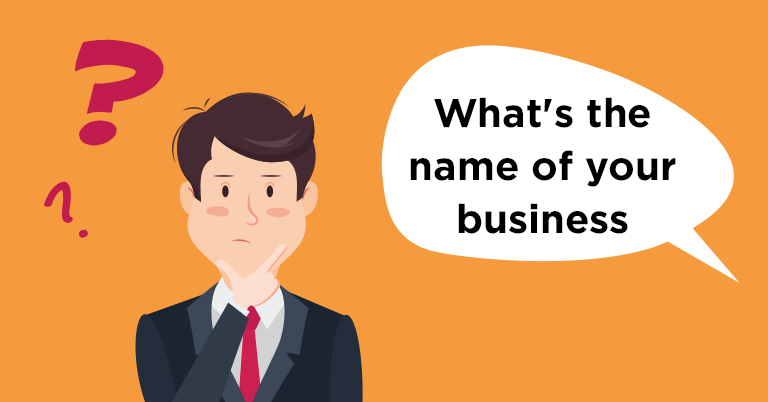 As choosing and registering a business name consumes time and money, you should avoid committing this mistake. Names like Polaroid sound stuck in time. Using another brand’s name can not only land you in legal trouble, it effectively means that you spent your time and energy in promoting someone else’s business! To avoid this scenario, make sure to do an initial Google search. Thereafter, you must try to get professional legal assistance. Social media platforms such as Twitter don’t allow businesses to create a handle with long brand names. This restricts your digital reach and thus, negatively impacts business prospects. Even if you create a short handle, it might not necessarily resonate or connect with the name of your brand. Also, if your business name does not align with Twitter, your handles at other platforms will too need to be adapted accordingly. Remember, every first idea is a cliché! While you love your brand name, your clients might not think the same. To avoid this situation, run-by your ideas through your target audience. You can do this using questionnaires and surveys. While business names are often preserved for posterity, at times it makes good sense to change them. Who knows Backrub, Search in Motion or Brad’s Drink? We prefer them as Google, Blackberry and Pepsi-Cola! While the success of your business depends upon several things, a right name is the crucial first step. Therefore, invest intelligently in it!